Many types of web applications are running on the Internet today. There are also as many ways to manage and maintain the infrastructure that powers those applications. IBM® Bluemix™ delivers quick and easy cloud capabilities to deploy and maintain your web application, with minimal hassle and overhead. 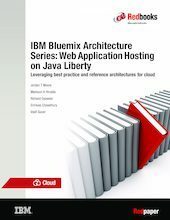 As you follow along with two lab-style scenarios, this IBM Redpaper™ publication demonstrates how to create and deploy a web-based collaboration application on IBM Bluemix. Lab 1 features a Java Liberty Profile application that uses the Delivery Pipeline, Data Cache, and Monitoring and Analytics services. The lab focuses on quickly getting an application started, importing some existing code, and using a Data Cache service from IBM Bluemix, Delivery Pipeline, and Monitoring and Analytics services. Lab 2 extends functionality of Lab 1 by adding Auto-Scaling and Load Impact services to load-test the application and watch the behavior of auto-scaling service in action. The target audience for this paper is technical cloud specialists who are familiar with technology of enterprise applications, but might be new to IBM Bluemix. This paper provides a good foundation to help you discover some of the powerful application development capabilities that are available in IBM Bluemix.